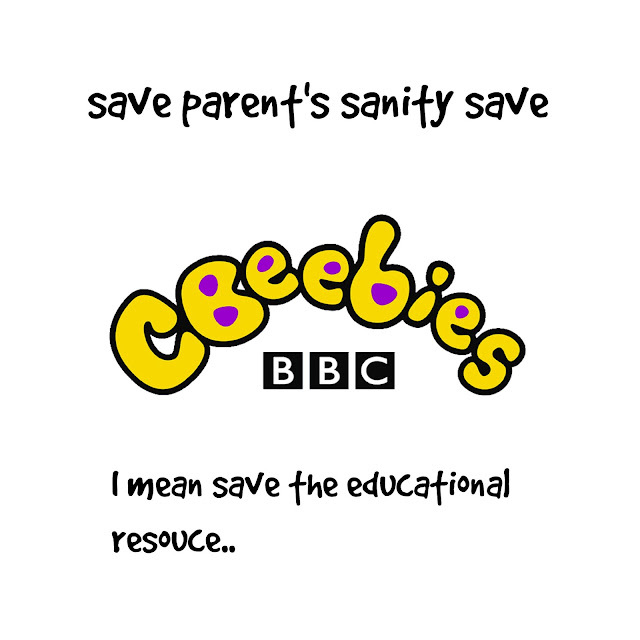 As a mum I just want to say to BBC get a grip don't get rid of CBeebies. I pay my TV licence for this channel as now I never watch TV. I actually don't watch anything except bing or twirlywoos. I'm not an Easternders person or a news person but I do watch a bit of topsy and Tim. How about rather than watching something that lots of young children who are educated watch you cut the budget of many celebrity induced programs you try to force on us. I'm sorry other than Luther, great British bake of and Sherlock I haven't watched anything in a long time. As a student I needed that extra hour I may have got in the mornings thanks to CBeebies . Trying to write essays and study with a toddler is nearly impossible but I could nearly manage then. Fast forward nine years and I'm using cebeebies for when I need 5 mins to start cooking or just wee in peace. See it's the educational programs that make me feel good when I've decided to spend he day indoors doing housework, it gets to lunch time and I feel guilty for doing nothing with the kids thank god Poi from show me show me a dressed at that blooming annoying star to reach the kids some lesson or another ( don't get me started with teddington). It would be such a shame it really would, I know we should not be putting our kids in front of the TV but let's be honest it's easy to do so, it's easy to have a quick ten mins shower in peace rather than having two toddlers banging on the doors of the shower trying to get in. Maybe we have become to reliant on TV but I don't want my kids watching some I player device they already can work this and watch the same program over and over again. No I want a channel so they can learn and watch things that are a bit different. BBC don't get rid of CBeebies, don't waste my Tv licence money because if you do I will cancel mine. It's pointless having it if we can't watch the 9am Bing, twirly wood and something special run. I as. A working mother never get a break the few mins I get from CBeebies mean a lot. Thanks a tired mum of 3 who has been in receipt of CBeebies for 9 years! I hadn't heard anything - were they thinking of scrapping cbeebies???? I am so fond of cbeebies - I remember watching the special cbeebies xmas pantos they put on when my (now 11 year old) son was just a baby. Yes there were MANY times cbeebies got me through the day - especially when the kids are ill and all they can do is sit and watch TV. My fave programmes are charlie and lola and I like Topsy and Tim too. Bing drives me bonkers but makes me happy seeing how much Miss T loves it. Long live Cbeebies!! !